PART I (Homework). DUE DATE: Monday, November 17, 10:00 am (beginning of Monday's class). Part II (project). DUE DATE: Friday, November 21, 9:00 pm. Homework 2 is worth 2.5% and Project 2 is worth 10% of the course grade. This project/homework consists of designing and implementing a program that plays a 2-players, board game. It will exemplify the minimax algorithm, and alpha-beta pruning, and the use of heuristic (evaluation/static) functions to prune the adversarial search. Usage of any other exisiting AI techniques (e.g. machine learning, search strategies) and/or techniques that you develop for this project along with the Minimax algorithm will earn extra credit and potentially improve performance in the tournament. (30 points) Follow the steps of the minimax algorithm to expand the full adversarial search tree, propagate the utility function values up the tree. (5 points) Based on the minimax expansion of the search tree, what is optimal move for your turn? (40 points) Starting from scratch, follow the steps of the minimax algorithm with Alpha-Beta pruning to expand the adversarial search tree as necessary, propagating the utility function values up the tree. (2 points) Based on the minimax plus alpha-beta pruning expansion of the search tree, what is optimal move for your turn? (3 points) Could have this move been different to the move you obtained on part 1. based on the full minimax without alpha-beta pruning expansion of the search tree? Explain your answer. where "line" is any column, row, or diagonal on the board. (2 points) Based on this heuristic expansion of the search tree, what is best move for your turn? (3 points) Could this move be different to the move you obtained on part 1. based on the full minimax expansion of the search tree? Explain your answer. The homework is due at 10 am on Monday November 17, 2003. Please hand in one HARDcopy of your group solutions to the homework assignment by the beginning of the class on Monday, Nov. 17. Already included in the homework description. 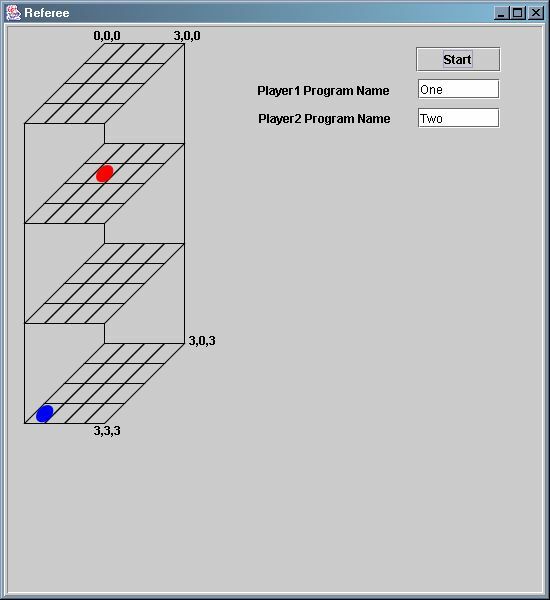 This project/homework consists of designing and implementing a program that plays 3 Dimensional Tic-Tac-toe. It will exemplify the minimax algorithm, and alpha-beta pruning, and the use of heuristic (evaluation/static) functions to prune the adversarial search. Usage of any other exisiting AI techniques (e.g. machine learning, search strategies) and/or techniques that you develop for this project along with the Minimax algorithm will earn extra credit and potentially improve performance in the tournament. Tic-Tac-Toe is a two player game (one of them being your computer program). We would deviate from the classical game which is in 2 dimensions and instead implement a 3-dimensional version of the game. We would have a 3D board which is a 4 x 4 x 4 grid. At the start of the game all cells in the grid are empty. Players take turns placing their pieces on the board until one of the player wins. The player who first manages to place 4 of his symbols/pieces in a straight line on the 3D-board is the winner. Player 1 uses Red pieces and Player 2 uses Blue pieces. To initiate the game the user needs to enter the names of the appropriate executables in the appropriate space provided by the Refereee. The program specifed in the Player 1 textbox would be allocated the Red pieces. Any move which places the user's piece on any empty cell on the 3D-board is a legal move. Moves alternate between Red pieces and Blue pieces. Each player gets a minute to play its move. If a player fails to do so the other player automatically wins. The program specified as player 1 will use the Red pieces and gets to play first.and player 2 uses the Blue pieces. The symbol S should be the symbol allocated to the player i.e. either 'R' or 'B'. The cell x,y,z is not already occupied. After the move, the place at x,y,z on the board will be occupied by the symbol S.
A player after making a move has 4 of his symbols (either R or B) in a straight line and thus wins. The board is full and no player has 4 of his symbols in a straight line. Then the game ends in a draw. Your group must implement a program that plays 3D Tic-Tac-Toe. Each group needs to pick a one-word (less than 10 characters) name for its program. Your program must read input from standard input and write output to standard output and each message should be terminated with a '\n'. Be careful here as the behavior might depend on the high level language you are using. For C you need to append a '\n' to the printf. For Java use System.out.print(Message + '\n'). System.out.println does NOT work. Your programs must write messages of length 10 or less and must adhere to the protocol stated below within this section. Your program starts off by reading from the standard input the symbol ('B' or 'R') allocated to it by the referee. That indicates to your program whether it is player 1 or player 2. Because the symbol should either be character 'B' or 'R'. Because though the board is 4 X 4 X 4 in size the locations are accessed by using subscipts from 0 to 3. Because the terminating \n is missing. Be careful how you handle this scenario. You might have to experiment a bit with your code before you can get things to work with the referee code that would be provided. This is because different high languages support different kind of input output handling. e.g. In C to flush data to the standard output we can terminate the printf with a newline character '\n'. But for the same code if we have Java we need to use System.out.print and not System.out.println as the final newline is sent as a separate message to the referee. R,1,1,1\0\0\n. This removes any chances of error as the referee would read in messages from player programs in blocks of size 10. After reporting an "ERROR\n" or a "GAMEOVER\n" your program MUST wait for an "exit\n" before terminating. Also at any time through the program execution if your program receives "exit\n" while it is expecting the opponent's move, it still MUST terminate your process. The intent of the design of the communication between your program and the referee is that this method will result in the least elaborated code, and that it allows you to implement your program in your choice of languages. Also the debugging is simpler as you read moves from the standard input and write output to standard output and thus you could run your code as a standalone program. Make sure any debugging messages you have you write them to the Standard Error stream as the messages you write to the standard output are strictly for communicating with the referee and must follow the specified format. Each group must submit the code of its program and an executable (or script) named groupname. The group is also responsible for providing clear directions specifying how the executable could be built by using the code. A makefile/script to do so would be highly appreciated. To have your creation considered for a grade, it must successfully compile and run on a CCC UNIX machine. A referee program, described below, will take as input the two executable program names representing the playing groups .The referee will then instantiate/execute) the programs. The program groupname will read input from standard input and output its moves to standard output. At the beginning of the game, the groupname would read from the standard input its symbol. If it reads a 'R' it gets to make the first move. If it reads a 'B' it would wait for the opponent to make the first move. A sample of the communication which might take place between the Referee and your programs is depicted below. The case depicted here is one in which the programs for 2 groups exchange moves and the Group1 wins after n moves. Group1 writes the first move (say R,1,1,1) to the standard output. The referee would validate the move, update the UI and communicate the move to the standard input of Group2 . The Group2 should then reads this move and make it's own move (say B,1,3,1) without exceeding the time limit. The programs and the referee keep exchanging moves till group 1 sends the nth move (R,3,3,3). The Group1 realising it has won also sends the GAMEOVER message to the referee. The referee sends the move to Group2 to check if Group2 is able to figure out that the opponent has won. Group2 realising that Group1 has won sends out the GAMEOVER message to the referee. The referee after receiving GAMEOVER messages from both players, sends "exit" message to both the players indicating that the player processes should terminate. * Note that a program will know that it is its turn by reading moves from the standard input. The referee files. (In zip and .tar.gz formats). A script human, with required Java code is also provided, to facilitate students to play against their own program. Changing the name of one of the programs to "human" in the Referee's interface helps a user to play interactively with a program or another human. Giving turns to each of the playing programs. 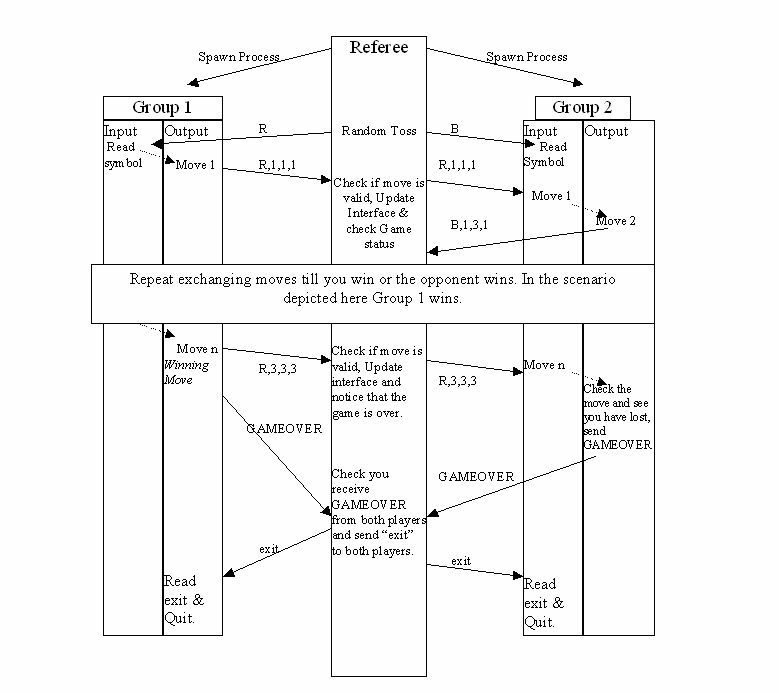 By reading moves from one player program and making it available on the standard input of the other. Detecting invalid moves. If the referee program finds an invalid move, it will make a note of the error. It would expect the opponent to notice the same. After the opponent's response the referee would stop the game, announcing that the offending program has lost and whether or not the winner recognized the invalid move. Ending the game when a player has won or all cells on the grid are occupied announcing that the game ended in a draw. ALL groups who want to participate in the tournament must submit the tournament version of their code via turnin with project name 'tournament' (even if you already submitted working code). The deadline for making the submissions is Sunday, Dec 14 2003 by 12:00(Noon). Your program must not consume computing resources during your opponent's turn. In this spirit, when it is your opponent's turn, your program should simply wait for your opponent's move. Your process must block. Place: CCC (II Floor Fuller Labs). These bonus points will be added to your project #2 score. The tournament structure will be determined when we know how many group will participate, but every group is guaranteed at least 3 games. Please email us at cs4341-staff AT cs.wpi.edu with any additions, deletions, or name changes of group members or groups from previous projects. You must submit code documentation along with the code. It must follow the Departmental Documentation Standard (see http://www.cs.wpi.edu/Help/documentation-standard.html). Project 2 is due on November 21, 2003 at 9 pm. One (and only one) member of your group must submit the following files using the turnin program. The name of the turnin directory is proj2. Finding a good static evaluation function and a good heuristic depends heavily on the experience you have with the game. I recommend you start playing the game and getting the flavor of what a good Tic-Tac-Toe strategy is. Also, research the strategies that other people have used for this and other games. Lots of information can be found in the references listed in your syllabus, the web, and magazine articles.